Ostensibly taking the Intel Scalable Xeon Gold 61xx family as the powerhouse base, Core i9-7980XE, also based on the Skylake-X architecture, comes rolling into HEDT town armed with 18 cores and 36 threads. Yup, a full 80 per cent more than the Intel champ of mid-2017. 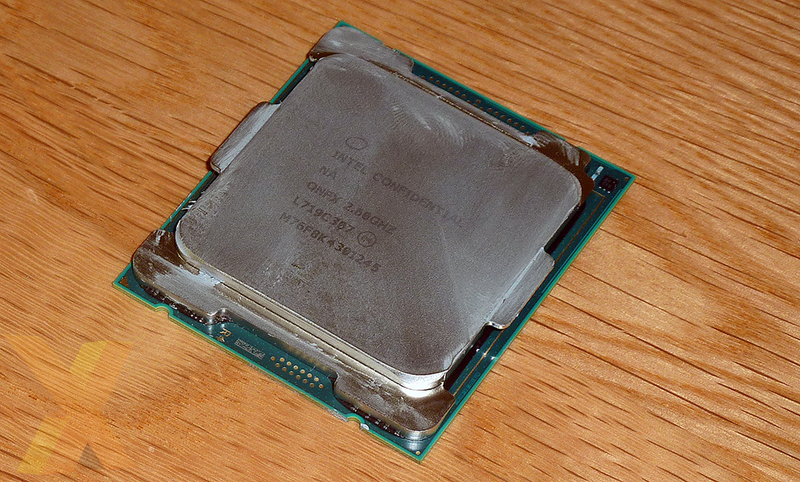 This gorilla of a CPU is supported by a further three new high-specification Core i9 chips, so let's see how they all flex their collective muscles in the usual table. 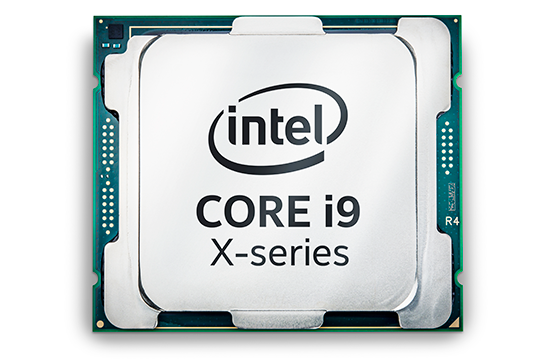 A few aspects to note about the premier Core i9 chips. Intel understands that it cannot balloon the core counts without consequence. This is why the base clock is scaled downwards in direct correlation to increasing cores. However, with so many cores on tap, it's worth investigating just how Intel recommends they be run. Its turbo bin specifications scale up as fewer cores are used. Should the motherboard be setup correctly, the processor should run all 18 cores at 3.4GHz (the 2.6GHz is a worst-case load speed), rising through to over 4GHz when load is minimal. It gets a tad more complicated because Intel has a greater number of turbo bins depending upon workload. Appreciating the server provenance of the chip and ability to run vector-heavy calculations through the AVX512 instructions - part of the Skylake-X and Skylake-SP feature set - Intel has an expanded frequency table. Back on point, the Core i9-7980XE also features Turbo Boost 3.0 technology. In this Skylake-X context that means the ability to run two cores at a higher peak speed than the standard Turbo, which is 4.2GHz. Intel says the chip can opportunistically ramp up to dual-core 4.4GHz because, at the factory, it speed-tests all cores to identify the best-performing ones. Think of this as tapping into the natural headroom reserve that would otherwise go to waste. Understanding the dynamic between cores, usage and frequency, back-of-the-envelope calculations suggest that the Core i9-7980XE performance ought to be 40-50 per cent faster than the Core i9-7900X we know about already. Even so, Intel has had to increase the package's overall power budget from 140W to 165W in order to accommodate for more processing ability, which is to be expected as it is the same as the Xeon this chip takes heavy design cues from. Yet this isn't merely a scaled-up version of the 10-core 7900X model. Intel uses a trio of dies to describe the core complexity of its Xeon processors. Everything up to 10 cores (Core i9-7900X) uses what it terms the Low Core Count (LCC) die and this is why we saw that chip released a while ago. The 12-, 14-, 16-, and 18-core Core i9s use the High Core Count (HCC) topology and therefore are equipped with a more complex mesh architecture for connecting the caches and cores together. There are also Extreme Core Count chips (>18 cores) that are currently restricted to the Xeon line only. What else? Though different in Intel-speak the Core i9-7980XE works on the same platform as the 7900X, so you will have to invest in an Intel X299-based motherboard. There's the same quad-channel memory support (down from six on the Xeon Gold), and rated memory speed is the same DDR4-2666 we see on other Skylake-X chips. Intel's promise of enhanced performance comes at a very real cost. The Core i9-7980XE is the dearest consumer processor to date, shipping at a staggering $1,999. Of course, the Ryzen Threadripper 1950X costs half as much; our benchmarks will show you just what kind of comparative value for money Intel offers. The processor looks just like any other Skylake-X on the outside, yet the increased number of cores also commensurately boosts the L2 and L3 caches by a factor of 1.8x This means 18MB of L2 and 24.75MB of non-exclusive L3. This increase isn't extended further to the PCIe lanes, which continue to top out at 44 compared to AMD's 64. This rough-and-ready table shows the progress Intel has made on its high-end desktop ambition, though there is an obviously high price to pay for the privilege of owning what looks like becoming the faster consumer processor to date. Intel is charging a whopping $1,999 for the Core i9-7980XE, doubling the price of AMD's rival Ryzen Threadripper 1950X. Even the 16C/32T model, Core i9-7960X, is priced at $1,699, with Intel firmly believing that it has a superior product to AMD. AMD will argue that you can purchase said Threadripper 1950X, a decent motherboard, 32GB of fast DDR4 memory and a 1TB NVMe SSD for the same kind of outlay as the premier Intel chip alone. That's true enough, of course, yet those considering these kinds of processors are less restricted by budget than, say, when looking at Core i7 vs. Ryzen 7. We'll see how the value perspective plays out later on in this review. Scaling back on frequency but using a wider, more muscular topology, let's see if Intel can indeed put AMD's Threadripper to the sword.